Photo of Alaska by Elijah Hiett. at UC Santa Cruz. Photo courtesy of Special Collections, UC Santa Cruz. 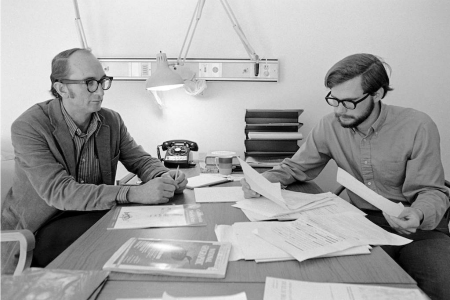 Richard A. Cooley was the founder of the UC Santa Cruz Environmental Studies Program. A native of Silver City, New Mexico, he graduated from the University of New Mexico, University of Chicago, and the University of Michigan, where he received his doctorate in resource conservation. Before coming to Santa Cruz, he taught in the Geography Department at the University of Washington. Dr. Cooley came to UC Santa Cruz in 1970 to start the Environmental Studies Program. A strong advocate of field studies, he initiated the Alaska Field Studies Program at the same time. He wrote numerous books and articles on natural resource conservation, public policy, and environmental studies. Dr. Cooley's 1963 book Politics and Conservation: The Decline of the Alaska Salmon is still used in the program today. He was a gifted teacher, and many of his former students are now in key positions in conservation work, particularly in Alaska. He retired from teaching in 1991 and passed away in November 1994 at the age of 69. 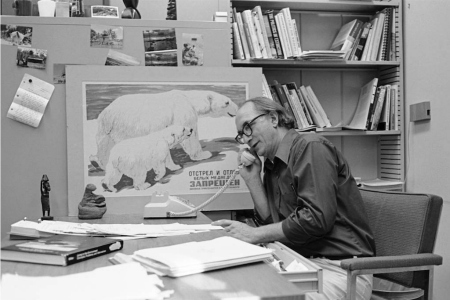 Dr. Cooley's work on conservation issues in Alaska, especially the international protection of the polar bear, was especially influential. He was a respected public policy researcher, appointed by President Gerald Ford to the Federal Marine Mammal Commission from 1974 to 1977. Prior to that appointment and during his career at UC Santa Cruz, he worked with the Alaska Territorial Conservation Organization and as director of the Alaska Natural Resource Center operated by the Conservation Foundation. He served for many years on the Joint Federal-State Land Use Commission. Other accomplishments included serving on editorial boards of scholarly journals, advising a wide array of government and private conservation organizations, and consulting on the development of environmental studies programs throughout the country, as well as being an accomplished sculptor, whose works were exhibited in Alaska, the Pacific Northwest, and California. The Richard A. Cooley Memorial Endowment was initially funded by the Friends Foundation International, a group comprised of eight UCSC alumni: Dean Alper, John Razz Cohn, Eric Dazey, Michael Freund, Ken Hart, James Skye Leone, David Paul, and Glen Price. They met in 1975 in an Environmental Studies class, 'The Political Economy of Ecology.' Shortly after a reunion in 1990 they decided to honor Richard A. Cooley, the founder and first chair of the program. Ben Shaine. Photo courtesy of Special Collections, UC Santa Cruz. The Friends shared his commitment of moving students from classroom to the community and natural lands as a critical part of their environmental education, and they funded the award from 1991 to 1994 to offset the costs of field work for students. Upon Dr. Cooley's death in 1994, the Friends Foundation gave a $2,400 challenge grant to the Environmental Studies Department to ensure the continuation of the award. Their challenge was more than matched by various donors. The Richard A. Cooley Memorial Award supports field projects which result in a tangible, positive action for the betterment of the natural environment or improvement in environmental quality. Preference is given to Environmental Studies majors who are continuing UC Santa Cruz undergraduate students. Awards are based on scholastic ability, demonstrated initiative, and potential for successful completion. Students who receive this award are required to submit a final report to the Environmental Studies Department and the Friends Foundation International. For more information about this scholarship, please contact the academic support coordinator in the Environmental Studies Department by telephone (831) 459-4136 or email, or visit the department's website.